What Really Do We Celebrate On Independence Day? It’s July 4th, almost, a time when Americans wave American flags and celebrate our independence from British occupation and control of our land. We appreciate the liberties we enjoy, and we know there are other nations who do not have such freedoms. Some of us wonder if we're as free as we think we are. Still, we wave our national flag with pride. 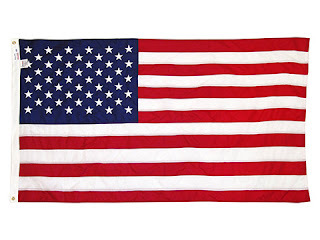 Our flag has great colors. Fifty white stars on blue, each representing a state—the pluribus (many) of us. Then the thirteen red and white streamers, flowing freely and representing the thirteen British colonies that declared independence from Great Britain and became the first states in our union—unum. We are meant to be many AND one. Our nation is only 241 years young, and we are having trouble with the unum of our motto E pluribus unum. Yet we still wave our flag. I like our flag. I do not, however, like our national anthem. "Oh, say can you see. . ." doesn't see far enough. It is time-limited, written to celebrate a particular military victory, and full of the language of bombs and war—hence fireworks with rockets and booms of bombs "bursting in air" through the night. I don’t mind making noise to celebrate but I admit to resenting the consistent language of war and destruction attached to patriotic celebrations. Warlike language is also attached, disastrously I think, to issues of health, mental and physical—we “battle” cancer, “fight” depression or a cold, enter “combat” against diseased parts of our very own body, then speak of “winning”or “triumph” when we feel better? What is this odd war we wage right within our own flesh? And what if we don’t “win”? Warlike language is a habit to change. On July 4th do we celebrate battles and victories won, or are we celebrating— with light and sound and loud booms in the sky— the sheer joy of our diversity "bursting in air? The spiritual meaning of this day, I believe, goes far beyond our own nation’s independence. There’s no" us" and "them". We honor ourselves, and we must also honor national freedom and dignity for all lands. It’s a day to remember the mutual interdependence of all humankind, all species of animal life, and all vegetation—an interdependence founded in the measureless vision of a Creator God. Trying to live too independently is perilous. We live well together or we perish together. I feel the same about my religion. It’s mine and I cherish it. But other hearts have faith as worthy and beloved as mine. We live well together or we perish. That’s worth a firecracker or two! A vision to keep us alive. Nothing expresses this spiritual magnanimity better than the beautiful music of Jean Sibelius (1899) and the expansive lyrics of the Finnish national anthem, Finlandia. A song of peace, for lands afar and mine.